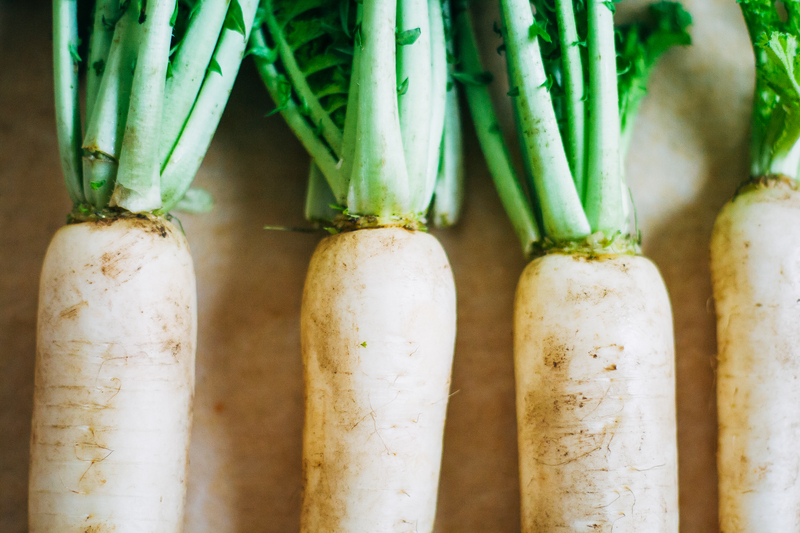 There’s a lot of hype around veganism – it comes with the territory. And I suppose like every other “movement” (or philosophy or idea or what have you), there are different “types” of vegans… like the ethical vegans, the hippie vegans, the weight-loss vegans, the health vegans, the I’m-only-doing-it-because-it’s-trendy vegans, etc. And probably a lot more in between. I’d probably categorize myself as a ethical-hippie-health vegan. But honestly, F the labels. Whatever the reasoning behind our choices, veganism is one of the most ethical, environmentally-friendly, and healthy lifestyles out there. Personally, I’ve never been one to proselytize or try to convert others in an unwarranted way. I think the best way to spread awareness about veganism is to talk about it (respectfully, always) when asked, and to cook delicious vegan food for my friends so I can sneakily convert them anyways (hehehehe). And surprisingly, it works! My mom now loves delicious vanilla almond milk in her morning coffee rather than the heavy coffee creamer. And my guy is probably 60% pescetarian now, which is a huuge step. It means so much to me when the people I care about take the time to actually learn why I’m vegan instead of automatically judging this choice. And that’s not even taking into account protein smoothies / supplements, which are pretty darn awesome if I do say so myself. So that’s my little rant about protein/veganism. And it’s probably a little ill-timed because this isn’t my most protein-heavy recipe ever, but this raw noodle bowl is deliciously light and healthy, especially for the summer months. I bought these beautiful rainbow carrots at the farmer’s market and was so inspired by the vibrant colors! It’s paired with a delicious miso & tahini dressing that has so much umami that my taste buds almost fell off. I hope you all love it as much as I do! This raw noodle bowl is light and refreshing for summer, paired with a delicious miso tahini dressing that's full of umami! Wash and lightly peel 3 medium carrots + 2 daikon radishes. 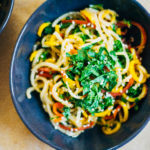 Spiralize noodles using your spiralizer. In a bowl, whisk together dressing ingredients until fully combined. Taste and adjust as needed. Toss dressing with noodles, adding as much as desired. To serve, sprinkle bowl with finely chopped kale and a few sprinkles of sesame seeds. The miso tahini dressing is slightly thin, which is how I like it. If you'd like to make yours a bit more substantial, add another tablespoon of tahini for a thicker consistency. Wow! This noodle bowl looks incredible- those colors! I didn’t realize they were actually carrots until I saw the ingredient list, looks just like pasta. I’ve never tried carrot noodles before but am really inspired to after seeing this. Great recipe! I’m not full vegan, although 90% of my meals are (the other 10% being vegetarian), but I totally agree with everything you say about veganism. In fact, you made me spit out my coffee from laughing describing telling a person that you don’t eat protein! I have done the same thing! LOLZ I totally loved your comeback…i think I might start doing that. I’m not a vegan but I have tried it and I was burdened with similar questions. These “noodles” look so pretty. I am recently really getting into tahini, so I’m excited to try your dressing. I went to an all vegetarian school growing up, so I am well versed in the type of questions you are getting. Growing up I was always surrounded by people who didn’t eat meat and understood that way of eating from a nutritional perspective. However, whenever we went on vacation or to visit relatives etc… we were bombarded with the types of questions you related. Now I’m off to the kitchen. I Just got back from the farmers market with my bags full of deliciousness! These colors!!! So so pretty. And it looks so fresh! Love it. I love this! I’m not 100% vegan myself but I also get that question a lot. There’s protein in so many plant based foods, it’s a lot more easier than what most people think to get enough. I love how simple yet delicious and refreshing this bowl sounds! Tahini + miso is a match made in heaven! This looks absolutely delicious! I love anything with tahini. And I always get the protein question too, which is quite funny. But I usually view it as an opportunity to debunk the myth that protein only comes from meat! This whole post resonates with me so much. It is all so true. And the noodle bowl looks great too:) I’m a huge fan of veggies turned into noodles! Since surely 1 year I want to try a raw noodle bowl. I have seen so many wonderful recepies that always speak to me.